Being able to send instant messages to your parents, student, and staff is unprecedented access! Push notifications help you connect like never before. Have fun with your messages, staying approachable while informative. And remember… if you want to know about something, chances are, everyone else does too! Here are some helpful ideas and tips to get the most out of your Push Notifications. They are an incredibly valuable asset! Don’t send alerts before 7am. Wait until you know everyone is awake and alert. 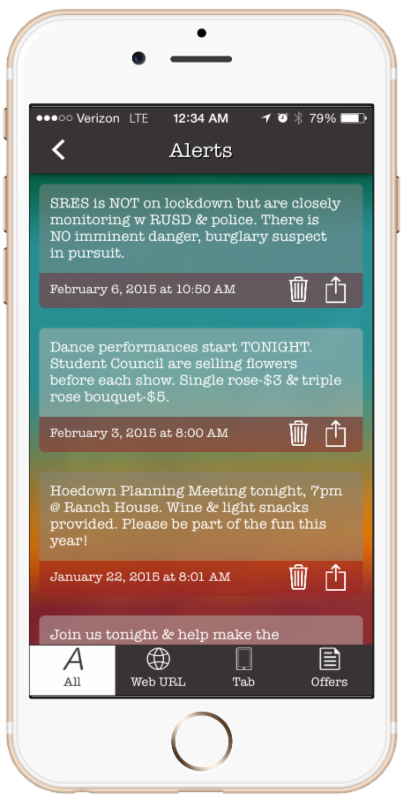 We think sending messages before parents leave the home and right before pick-up are great times to send alerts. Parents will be checking their phones and have school on the brain. Include additional information/links. Use the ‘Content’ section to link to volunteer sign-ups, calendar, supply lists, or whatever your push is about. Schedule your push notifications. We get busy and it’s easy to forget or get wrapped into other priorities, so use the scheduling feature to set up pushes for minimum days, fundraisers, and anything else you know is coming up. Sit down at the beginning of the month and just get a bunch done! Keep a spreadsheet, calendar, or running list to keep your pushes organized. Include your all Parent Group members, key staff, and even student groups when planning your Pushes. They will have lots of great information. Plus when their information goes out, they become an even bigger fan of the App!